When the Navy or Merchant Marines no longer need a ship but wish to reserve it for future emergencies, they tow it to storage harbors, empty it of all fuel and cargo, and seal its windows and doors. The ship is protected from salt-water corrosion and the interior spaces are dehumidified. This technique is called “mothballing,” much like preserving a wool sweater when put away for the summer. That was the fate of many of the Victory ships used during and after World War II. Produced to replace the slower Liberty ships, Victories served their purpose as faster emergency ships for the U.S. Maritime Commission but were eventually no longer necessary. One hundred seventy of the ships were sold. Twenty were loaned to the U.S. Army. The rest sat quietly dormant, “mothballed” for future use. Some were reactivated during times of national crisis, including the Korean War, the Suez Canal closure of 1956 and the Vietnam War. Others were retained as logistic support ships for the Military Sea lift Command. However, the years soon passed and many of the ships in the reserve fleet were sold for scrap, their metal recycled. Of the thousands of Liberty and Victory ships that once graced the sea only a small number remain today. Among them are the Lane Victory in San Pedro, CA, the American Victory in Tampa, FL, and the Red Oak Victory in Richmond,VA. During the 1940s and beyond, Chelsea Clock supplied thousands of mechanical clocks to the U.S. Military for use aboard both Victory and Liberty ships, as well as on submarines, destroyers, cruisers, battleships and aircraft carriers. In fact, in 1943, Chelsea was one of the few companies presented with the prestigious “E” award by the U.S. Government in recognition of manufacturing excellence for its production of military clocks. Today, Chelsea Clock continues to produce a vast number of mechanical and quartz timepieces for installation aboard U.S. Navy and Merchant Marine ships, as well as on numerous military and peacekeeping vessels. In addition, Chelsea Clock offers the Patriot Deck Clock and Radio Room Clock, authentic quartz reproductions of original military timepieces used by the U.S. Government. Collectors and military aficionados are able to share in the Victory story by adding an authentic Victory ship clock to their boat, home or office. Chelsea Clock has reclaimed over 80 marine mechanical clocks previously installed on Victory Ships built by the U.S. Maritime Commission during World War II. These authentic military timepieces, produced for the U.S. Government in the 1940s, are being returned to optimum working condition by Chelsea’s certified Repair & Restoration technicians. As each piece in the Vintage Victory Collection is restored, it will be made available for purchase on this site. I believe that I am on your mailing list about your used clocks, i.e., victory ships, but I am not sure. That is why I have take the time to contact you via this comment section. We have added your email address to our list to receive all communications related to our vintage clocks, including the U.S. Victory Ship clocks. Thank you! I have a 6″ ships bell clock I purchased in 1976. Don’t remember ever having the black “stop” plug mentioned in this article. How does one go about obtaining same? We would be happy to send one to the address that you’ve provided! I have a Chelsea clock that was my fathers and given to me several years ago. Dad worked in the Bethlehem Steel Ship Repair Yard in Baltimore for 41 years, including the years of WWII. I believe this clock was from a ship that came through the yard during the war or right after the war. I can’t find any similar clock faces on any websites. The face cover screws off and the numbers are decimal (1, 2, 3…). It only has one key hole in the lower center and a speed dial on the right side about 2:30. The serial # on both the inside works and the back of the exterior brass housing is 313066. The face says “Chelsea Clock Co. Boston” on the upper half and “U.S. MARITIME COMMISSION Serial No. 5069” on the bottom. Is there any way you can determine when it was issued and to what ship it was issued? According to our records, the 6” marine mechanical clock you describe (serial number 313066), a screw brass case and bezel with U.S. Maritime Commission on the dial, was sold to the U.S. Maritime Commission on August 24, 1942. Unfortunately, we do not have information on which ship it was installed. However, you may wish to contact the U.S. Maritime Commission for this information. The 6” Marine Mechanical clock you describe (serial number 376218) was sold to Avondale Marine Ways, Inc. on August 6, 1943. Unfortunately, we do not have any further information regarding the ship on which it was installed. You may wish to contact the U.S. Maritime Commission for further details. I have a Brass Case, Screw on bezel, Serial number L298371. The dial says US Maritime Commission. Is this the type that would have been on a Liberty Ship since it is early WWII? Also, approximately when did Chelsea begin putting these into Bakelite cases? My thought is that was mid 1943 when brass was quite scarce. For serial number 298371, our record book indicates that this piece was sold to South Portland Shipbuilding Company on April 16, 1942 and it is listed as a marine mechanical clock (no bells). It may very well have been installed on a Liberty ship, but you may wish to contact the U.S. Maritime Commission for further information. You are correct about the switch from brass clock cases to phenolic (or black resin); this happened around the beginning of WWII when metal was more scarce (due to the high demand for war efforts). Also, because many clocks were installed on ship decks, the military favored black phenolic cases, as they were quite durable against salt and moisture – plus they didn’t reflect light (as brass cases did), which might be seen by enemy ships. I have a Chelsea Clock, 6″ marine mechanical clock, white face with minute hand, F/S dial on right side of face with 24 hour time also, stamped says U.S. Government, Ser No. and there is no number listed. Have no key, found this in my deceased father’s, retired US Navy, items. What can you tell me about this clock? Suspect it is post WW 11 vintage??? Thank you for writing to Chelsea Clock. There should be a serial number etched into the back of the clock case. We would need this number to reference the year of manufacture and any other information that may be in our records. Thank you. develpment of Loran and, later GPS. That Chelsea clock was wound by the same sailor’s hand at the very same hour–for ultimate accuracy. Yet, the Navy still heldd the tradtion: ‘SIR, REQUEST PERMISSION TO STRIKE EIGHT BELLS”. Hello James, Thanks very much for your note and for your service! We appreciate hearing from you. Thanks so much for sharing your story here. We certainly appreciate hearing from you and thank you for your service as a U.S.Marine. I am sure friends of Chelsea Clock enjoyed reading about this fine Navy tradition! I am researching a Chelsea ships clock for a friend, and was wondering what you might be able to tell my about it. It is a about inches diameter, and on the back is the number 711790. Thank you for your time and information. For serial number 711790, our log book indicates that this 8 1/2″ Marine Mechanical Clock was originally sold to Samsel Rope & Marine Supply Company on June 30, 1967. I’m afraid this is the only information we have for this timepiece. I hope this is a help. Sorry for the late reply. Just wanted to thank you for the information. I have a Chelsea radio room clock with a brass face in black phenolic case. All the pictures I can find online have a face that is painted with red but mine is painted black around the edges and in the times for radio silence. There is a number scratched into the back of the clock – 475521. It appears that the clock hands have been replaced with a decorative hour and minute hand. Can you tell me if this is an original or a reproduction? Thank you. I have an 8 1/2″ clock with serial number 710130. I was wondering if you could provide the exact name for this clock and any information about its provenance. Also, what size winding key does this clock use? Thanks in advance for your time. U. S. Maritime Commission, Ser. No. 4591. Is there any information available about this Clock? I have an unusual Chelsea clock, serial number 302924 (movement and case). Serial numbers date to WWII era, and design is that of a ‘Zig-Zag’ clock, but Demeters’ “Chelsea Clock Company, the first 100 years” says that such clocks would have bakelite case and dial marked with Navy during that time. I have an 8-inch, 24-hour dial, “U.S. NAVY” ship’s clock in a black phenolic case. Sadly a previous owner tried to strengthen the numbers with gold and silver paint. Serial number on dial 84781E. SN on movement 346174, as well as 12E 1966. – In having this dial repainted, what color paint? Versions I see look cream (aged white?). I also sometimes see what appears to be glow paint on the hand spades. – Were the hands – or any of the dial characters, rings, etc., done in glow paint? – What is appropriate for this clock at this period of production? I’d like to do a true and proper job. The model of clock you described is not one that would have used luminous or glow-in-the dark material. So if it has a black dial, the dial numerals would have originally been bright white, and may have yellowed or become dirty over time. So the proper coloring should be white. Thank you so much for the quick reply and helping me do a correct restoration. Thank you very much for the quick reply and helping me do a correct restoration. Hello there. My grandmother recently gave me my late grandfather’s U.S. Maritime Commission Chelsea clock that I have always liked for my birthday. It is a 6.5 inch black clock (with the window closed-the back of the clock is larger in diameter) with a brass dial and black numerals. The serial number etched into both the back of the case/housing and on the inside works is 447760. Can you please give me any information you might have about this clock? I would very much appreciate it! Also, what would be the proper method of contacting the U.S. Maritime Commission to request information about what vessel this particular clock was installed on? Thank you very much! I left a comment here 3 weeks, 5 days ago, according to this page, asking about the original buyer and date of purchase, along with any other information you might have, regarding an old U.S. Maritime Commission Chelsea clock that I recently received as a gift from my grandmother, with the serial number 447760. Other descriptive information about the clock is in my previous comment on this page. Could you please get back to me with the requested information as soon as you can? I sure would greatly appreciate it! I also asked what the proper method of contacting the U.S. Maritime Commission would be in order to request additional information about the particular vessel(s) my clock was installed on. Thank you in advance for the requested information, and thank you for your time. Our sincere apologies for the delay in responding. Serial number 447760 was sold to the United States Maritime Commission on June 28, 1944 and was listed as a 6″ marine mechanical clock. I’m afraid this is all the information that we show in our manufacturing log. The U.S. Maritime Commission website, http://www.archives.gov/research/, may be the best place to start to request more information regarding the ship in which the timepiece was installed. Thank you for contacting us at Chelsea Clock. Good luck with your search! I have a U.S Navy clock serial number 79863E, is there anything you can tell me about it? Thanks for your note. Unfortunately, the number you mention (#79863 e) is the government assigned serial number for the clock, not the serial numbered issued by Chelsea Clock. We would need the Chelsea Clock movement serial number, located on the brass back plate of the clock’s movement. It will have the following markings: Chelsea Clock Company- Boston, USA – and it should be a six-digit number. To gain access to the movement back plate, remove the three larger screws around the outer edge of the dial and the plastic trim ring (if your clock is equipped with one). Hold the clock case upright and gently tilt the case forward to release the dial and movement assembly. The markings should be on the brass back plate of the movement. Also, look on the back of the clock’s outer case to see if the same six-digit number is scratched into it. Email us with the number you find on the movement, and we should be able to provide you a range of four years in which the movement was made and sold. I recently picked up a 3″ brass screw case Chelsea clock with Ball Watch Co Cleveland above the winder. It has a straight line balance and is in overall wonderful condition. Can you help me date the movement serial number: 30766 and add any available information on the buyer? According to our manufacturing log book, serial number 30766 was sold to Ball Watch Company on October 12, 1907, and is listed as a 2 3/4″ automobile clock. Unfortunately, this is all the information available for this serial number. Thanks! I’m looking into this for you and will email you when I know more. Thanks! I have a Chelsea clock recently inherited from my grandfather, serial number 424037, and I was wondering where I could obtain a replacement key, and who it was originally sold to. Thank you for your note. Replacement winding keys are available for purchase on the Chelsea Clock website under “Accessories” – http://www.chelseaclock.com/pl/clock-keys. Unfortunately, we do not see an entry about serial number 424037 in our official log book. At times, orders placed by the U.S. Government for several Chelsea clocks are not individually recorded. We regret that we do not have further information. I have a Chelsea ship clock s/n 577515 scratched into the case and on the movement. The clock face is black, white numbers with luminous dots covering the outer white rectangle and triangle five minute markers. It is a 12/24 hr type, vertical regulator, with a circle of inner minute dots with 13 through 24 around it. It has U.S. Government on the face. The sweep second hand is not the half moon type and may have been replaced with non standard hand. Is this a Type B dial face on a Model 11E clock? If not, what is the Type and Model? According to our log book, serial number 577515 was sold to the Imperial Upholstering Company on September 30, 1952, and it is listed as an 8 1/2″ marine mechanical clock with multi color dial (or as some refer to it, a sector dial). This type of clock was primarily used by the Air Force. However, the upholstering company may have simply purchased a number of the clocks for display or give-away purposes. Unfortunately, we do not have further information. Thank you. Hi! I Recently became the proud owner of a fine Chelsea timepiece! It is a 24 hour white face about 8 1/2″ across. Black phenolic case with the serial number 848946 on the back that matches the movement case inside. It has Chelsea Clock Company Boston on the top of the face and US Government on the bottom. I would like to find out any information you may have on it. Did all these clocks go on ships or were they used on land as well? We have a 12″ Chelsea clock, serial #22454. I didn’t see that serial number in the listings but the ones near it were dated 1906-7. It belonged to my husband’s grandfather and my husband seems to remember that the company changed out the case during the war to use the brass. Can you tell me anything more about the clock? It looks like it has been converted for electric use. I’m checking the records books and will email you my findings. i have a mk1 deck clock, serial 442663. was wondering if you had any info on it. thanks. I have found at the attic an old case with the clock with the serial no 298099 on the back. do you know sth more about this piece? I rescued a phenolic 8-1/2″ marine mechanical (SN 690023) off a WWII ship I served on. I think it’s from the early sixties. Could you date it for me? I’m looking into this in our records books and will email you my findings. Thank you! I’m looking into this and will email you when I have news. I have a clock with SN 475711, with a bakelite case with 475711 etched on the back. Is there anything you can tell me about it? Can you assist me with information on an Chelsea, U.S. Gov’t clock with an serial # 86295E? Could you please provide any information sites where I might trace the age & provenance of a Chelsea U.S. Navy Clock? The serial number is: 82763E. Any assistance you can provide is most appreciated. Thank you. Let me check our records books and email you my findings. Thanks for your inquiry and for reading our blog! I have a navy deck clock serial number 22736E. Can you tell me anything about it? We have a black 8 1/2″ deck clock, with serial number 664742 scratched into the back. Would you able to help us determine what year it was manufactured? Any other details you might have would be greatly appreciated. Best! We are looking into this and I will email you our findings once we consult the record books. Thanks for your inquiry! I noticed that some clocks have a serial number and some do not. What is the serial number represent? All clocks have a serial number on the back of the backplate. We can use the number to look up its origins in our record books. I have a Chelsea clock #11726. What Ship was this assigned to from wwII Atlantic Fleet. Is this the serial number from the back of the backplate/movement or is it the Navy serial number from the front? We will need the Chelsea serial number from the back to look into this clock’s origins. Thank you! I have a wall clock that has the Chelsea name on it. It also has the US Navy on it but no serial #. I do have the key that goes with it. I was told it came off one the older ships just not sure which one. Since it doesn’t have a serial # I am suspicious also. What can you tell me about it if any thing. The serial number should be on the back of the backplate. You need to open it to get to it. Please let us know if we can help in any other way. Thank you! I am assuming you are talking about taking the plate off that is inside the clock that has the hour #’s on it, not the back of the clock. I am afraid to do that, afraid I might break it. Thanks for your help. I’ll just wait and be surprised where it came from. Thanks Lindsay. You have been a big help. Hi, can you provide any info on clock #46895? Thanks. Clock is brass with a screw face. Would appreciate any information you may have on it. I am looking into this for you and will respond to you via email shortly. Thanks so much! I have two Chelsea mantle clocks, both Babro #31 from 1915-1919, one ships bells; one house bells (#106611 & 129560). The mahogany cases don’t match, and have both obviously been refinished over the years. I would like to get them back to original and matching – or close to it. The only description I can find regarding the original finish is from the 1923 catalog, where it is described as “Mahogany Cases, dark dull finish.” Can you tell me how these were originally finished (oil, shellac, lacquer, etc.) and how I might best approximate that finish today? I would also appreciate any other information you can provide about these clocks. Thank you. You can submit a repair request through the website or give us a call at 617-884-0250 to speak with someone about your clocks. Thanks again! What’s the best way to remove several coats of paint (not sure what type of paint probably oil based from the bakelite? I’ve just had my Chelsea clock restored to it’s original state and now I’d like to get the bakelite back to its original condition/color. It’s a mid-1940s vintge ships clock with the screw case. Feel free to give us a call to discuss this further, 617-884-0250. Although our record books allow us to see who the clock was sold to and when, we are not able to verify with certainty which clocks served on which specific ships. I have a Chelsea ships bell clock completely functional. It is black. My question is, it has a cartoon character on it. Does anyone know what that would be. Hi Sandy, Can you email me a picture of the clock and the cartoon character? My email address is lindsayt@chelseaclock.com. Thanks! As a veteran of the US Navy, I was given as a gift, a Chelsea Ships Bell clock from a friend. Serial Number 407529. It is a black case, black face, clock with white hands and numbers. It is in full working condition. It would be great to find out any history I can about it. Please send this request to me directly at lindsayt@chelseaclock.com so that I may look into it for you. Thank you! I have a 6-1/2″ Chelsea Ship’s Clock with black face marked U.S. Navy Ser. No. 22319-E. The back is marked Chelsea Clock Co, Boston, and appears to be integral to the case. Can you tell me anything about it? Does the E in the serial number represent the Excellence award awarded to Chelsea? Serial numbers with an E indicate that this is a military serial number and not the Chelsea Clock serial number. Our serial number should be on the back of the backplate. If you can send that serial number to me directly at lindsayt@chelseaclock.com, I can check out our records books and get back to you with any info we have on your clock. Thanks so much! 1. Do you have any information about this clock? 2. What size screws are used to mount it? I have a Chelsea clock that was given to me by a retired U.S. Navy Chief. He said it was from the bridge of the USS HULL (destroyer) Below center on the face it says U.S. Government and has the number 820129 however, on the back of the clock, right above the “Chelsea Clock Co. Boston” there are numbers that look like they were also scratched on by hand, like the ones on the face. But, these numbers are 820806 I’m wondering if you can tell me anything more about this clock? Thank you. I have a deck clock serial # 57190. Can you date this? I notice that some clocks have a date on the dial and others don’t. Can you tell me why? As my Uncle was a WWII Navy vet, I am guessing the clock fits the 1940 to 1945 vintage. Can you tell me what ship or type of ship this came from? Thought-provoking comments . I am thankful for the info . Does anyone know where I could possibly get access to a blank VA 10-5345 version to type on ? Hi Lindsay! What a great site and source of information you are offering. Just reading your questions and answers has taught me much! I found a Chelsea clock at a garage sale and am fascinated with the history that I have gleaned from researching the history of these clocks. It says “Chelsea Clock Co. Boston” “U.S. 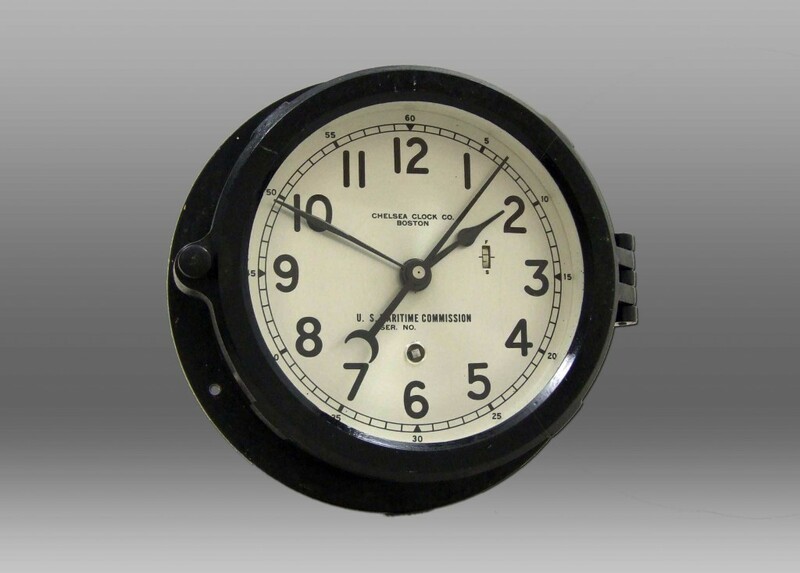 Maritime Commission” on its 6″ dial It is in a black bakelite type case. Embossed on the back of the case is “Chelsea clock Company Boston.” I never would have realized that the scratched numbers on the back of the case meant anything without your site. The numbers scratched on the back of the case are 382004. Can you tell me anything about the history of this clock? The word “maritime” is also scratched on the back of the case and another word that I cannot read. I just read through all of these comment’s and must commend you for responding with the info many were seeking. I can certainly understand the possible future business that is generated but it truly is a rarity in our present fast paced society where the dictates of satisfying boards and shareholders has relegated customer service to the bottom rung and you are to be applauded. If you would be so kind to entertain my own query of my 1st original Chelsea that I was fortunate enough to pick up today when it availed itself at a local “junk dealer” his proclamation not mine. Ha Ha. This clock remarkably started running after putting a wind to it and has continued running as of this writing. Any history of purchase would be greatly appreciated and I have noted your response to others about contacting the Maritime Commission for possibility of determining ship placement. This clock unfortunately was seperated from it’s original key and I also noted that y’all offered modern replacements but was curious if originals were also obtainable from Chelsea or if I would have to seek one from other sources. I have a black 6″ Chelsea Clock from Boston the serial number on the back says 613792. My dad was career military and I got it when he passed October of 2015. Any information would greatly be appreciated. Hello. I have a Chelsea U.S. Navy clock with naval serial #74287E. The case is 268529 and the movement 421067. I was told that it was not unusual for Navy clocks to have mismatched cases and movements. Technicians lined up clocks for repair and then housed them in available cases. Is this true? Is there any information on this movement. Very appreciative of your help and this excellent blog. HI have a Black ships clock made by Chelsea Clock Co. Boston. U. S. Maritime Commission . My grandfather gave it to me many years ago. It came off a navy ship. It is approximately 6″ round, the front comes unscrewed to set the time with a wind up key. I believe the serial number scratched on the back is 475047. I was wondering if you could give me any information on this clock. it has a white face with black numbers. I have recently retired (Major USMC) and I was presented with an old Navy ship clock. The clock is a 1943 WWII U.S. Navy War Ship clock with the following information Chelsea Clock Co. of Boston serial number 76378E. Any information you may be able to provide me regarding this clock will sincerely be appreciated. Any historical information you can provide including, the Navy ship and the final disposition of the ship. Any information on Chelsea US navy deck no 3 clock serial # 20757 (b) would be greatly appreciated! In addition, there is the # n 3619 etched in the face of the dial below the words US Navy deck clock # 3 . Could this be a ship identification of some sort? I have a clock exactly the same as the one shown in the picture in Part 2 of the US Victory ships history. Could it have come off one of the Victory ships? Hy, I came in your blog, because I have a Chelsea clock. I have this from a long time and didn’t knew about its history until I found it in you blog. I am researching because I want to sell it. I received a clock for Christmas there is no serial numb on the face, but on the brass plate inside it says 430847. On the interior of the casing it say B6902. Can you tell me what I have? The face say US Maritime Commission. Hi- I recently picked up a Chelsea Clock Co. 24 hour dial clock in bakelite-Serial 3473064. The dial has no identification but for a silver tag 1.5″ x .5″ with the number 85108E. The body, door, interior, and exterior were all painted over the bakelite in a flat silver color. I am trying to figure out what type of ship this was used on between 1945-49. Any help is appreciated. Hi Thomas, Sorry, but there seem to be too many digits in the serial number you have provided, and there is no match in our manufacturing log. Could you please check again. Thank you. Hello Gary, Could you please provide the serial number that appears on the movement, and we may be able to provide some information about the year of manufacture and to whom it was originally sold. Thank you. Hello John, Could you please provide the serial number that appears on the movement, and we may be able to provide some information about the year of manufacture and to whom it was originally sold. Thank you. Thanks for your inquiry. If you could provide us with the serial number from the back of the clock case (or from the inside mechanism), we may be able to find some information about the date of manufacture and to whom it was originally sold. Thanks! Thank you for your inquiry. According to our manufacturing log, serial #497209 is listed as an 8.5″ Marine Mechanical Clock and was originally sold to Kelvin, Bottomley & Baird Co. on March 11, 1946. Unfortunately, that is all the information that we have on file. Thank you! I have a 6 inch Chelsea Clock.. I was wondering if the face would have been the original one for this clock. Thank you for your inquiry. According to our manufacturing log, serial #450813 is listed as a 6″ Marine Mechanical Clock and was originally sold to the U.S. Maritime Commission on July 27, 1944. The dial was originally silver, and the numerals and hands were originally black. Unfortunately, that is all the information that we have on file. Thank you! Thank you for your inquiry. According to our manufacturing log, serial #161342 is listed as a Ship’s Bell Clock and was originally sold to John R. Roberts & Son Co. on November 13, 1924. Unfortunately, that is all the information that we have on file. Thank you! I have a “Chelsea Clock Co, Boston” Deck clock. US MARITME COMISSION is on the dial but is covered with white paint and does not show the serial number. The serial number inside on the works is 452544. Any info would be appreciated. Thank you. Thank you for your inquiry. According to our manufacturing log, serial #452544 is listed as a 6″ Marine Mechanical Clock and was originally sold to the U.S. Maritime Commission on July 20, 1944. Unfortunately, that is all the information that we have on file. Thank you! I have recently been given a Chelsea, US Navy Zig Zag clock with a phenolic case. The serial number on the case and movement is 439436. The provenance I have indicates it was removed from the USS Nevada BB-36 just before it was used as a target for the Bikini Atoll atomic bomb tests. I wonder if you can verify the serial number and the year of manufacture and if possible delivery to the USS Nevada. Also I don’t think the key I have is original. Do you have replacements that match the original key? This clock came to me through a friends family and I would like to verify its history for them. Hi, I have a brass face 8” 24 hour Chelsea clock with a black painted brass base. Can not find anything similar ! The etched serial # is 131947-WB7. The first “1” might be just a scratch. Any information would be greatly appreciated. Thank you for your inquiry. According to our manufacturing log, serial number 131947 was sold to the U.S. Naval Observatory on July 24, 1919, and it is listed as a Marine Mechanical Clock (no specific size noted, unfortunately). I hope this is helpful. I have a U. S. Maritime Commission Serial number 437941 clock. How can I get information about this Chelsea clock? Like most of the comments here, I have a Chelsea nautical clock with a number etched on the back I assume is the manufactering number. Do you have any info on # 480500. Thank you, Steve US Navy (ret). I have a US Maritime Commission with a s/n of 416446. Any information would be greatly appreciated! Love the resource you provide with this page. I recently inherited this clock and am interested in having it refinished/cleaned in the near future. Thanks for the info on your repair shops! I recently purchased one of your wonderful clocks…a 6″ dial in excellent working condition. I believe it’s a Chelsea radio room clock. It has a brass face in a black phenolic case. It has unusual coloration on the dial…two red shaded areas, one that spans the area from 3-3:30 (15-15:30), the other from 0900-0930 (21-21:30). On its face the clock is marked Chelsea Clock Co., Boston above the centerpost, and U.S. Maritime Commission below. Ser No. is etched below but there’s no serial number there. A single winding port. And the “fast slow” adjustment wheel between the hands and the ‘3’ position on the dial. No bells. It has the minute, hour and second hands…and a third brass colored hand, the purpose of which I’m uncertain. No serial number on the dial, but etched on the back of the clock is 449986. Any information would be greatly appreciated. I recently purchased a U.S. Maritime commission Chelsea ships clock. No SN on the dial but a SN on the works. The SN is 413786. Can you tell me anything about it. I think it is a radio room clock with red markings on the dial.